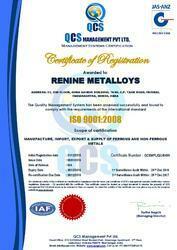 Established in the year 2008, we, Renine Metalloys, are an ISO 9001:2008 certified organization engaged in manufacturing, supplying, importing, exporting and distributing of a massive assemblage of Ferrous & Non Ferrous Products. Our product range comprises of Monel Products, Hastelloy Products and Inconel Products. We have been able to become the preferred choice of our customers within the few years that we have served in the industry. In a short time period, we have achieved unmatched success and an enviable name in the market. Owing to the flawlessness and optimum quality, our metals and alloys are vastly demanded in mining implements, aircraft, power, agro implements, fire equipment, oil & gas and extrusion applications. At Renine Metalloys, we have established an excellent infrastructure that is set up with machines and equipment that help us in manufacturing a broad line of flawless metals and alloys. 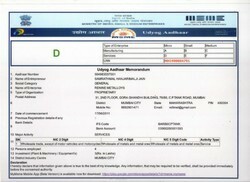 Our well-trained professionals make sure that the existing industry standards are followed during the operations. We are concerned with the diverse demands of our customers and provide customized solutions to fulfill the same. It is because of the hard work and undivided dedication of our team that we have earned a large number of clients worldwide. We are a proprietorship firm under the incomparable mentorship of Mr. Nilesh Mehta and Mr. Satish Jain. Magnificent industry knowledge and experience of our leaders have inspired us in providing the best quality possible. We wish to expand our business in the near future while maintaining our position and impressive track record. Our importing countries are China, Taiwan, Hong Kong, Netherlands, Germany and exporting All Over The World. Trading & Exports of Stainless Steel, High Nickel Alloys, Alloy Steel, Pipe & Pipe Fittings, Flanges, Fasteners, Studs, Bolt, Nuts, Washer, Tubes, Flat, Round etc. Located at Mumbai (Maharashtra, India), we own a sprawling and well-equipped infrastructure. Owing the support of this infrastructure, we have been able to perform our all business related activities without hassle in a streamlined manner. At our infrastructure, we have installed sophisticated machinery and latest technology, due to which, we have been manufacturing and supplying a precision-engineered range of Flanges, Round Bars and Ferrous & Non-ferrous Metal Products. To look after this infrastructure, we take help of dexterous experts, who keep abreast of the evolving trends and accordingly update the machinery and employed technology. We have divided our infrastructure in various units with the purpose of performing all the activities smoothly. Leveraging on the support of dexterous and diligent team, in a short span of 4 years, we have become a top-notch firm from a furnishing company. This team consists of gems, which ensures that our organization never lacks behind in achieving the targets. Our teammates are well-versed with their area of work and they further keep themselves abreast of the evolving trends to enhance their knowledge. They use their experience and commendable knowledge to satisfy our patrons by offering them Flanges, Round Bars and Ferrous & Non-ferrous Metal Products. Renine Metalloys is considered a trusted name that offers quality grade metals and alloys that find vast application in engineering, aerospace, pharmaceutical and other industries. Owing to the outstanding features, our product selection is vastly demanded and accepted among our valued customers in India and worldwide.